G-quadruplexes are naturally-occurring structures found in RNAs and DNAs. Regular RNA G-quadruplexes are highly stable due to stacked planar arrangements connected by short loops. However, reports of irregular quadruplex structures are increasing and recent genome-wide studies suggest that they influence gene expression. We have investigated a grouping of G2-motifs in the UTRs of eight genes involved in polyamine biosynthesis, and concluded that several likely form novel metastable RNA G-quadruplexes. We performed a comprehensive biophysical characterization of their properties, comparing them to a reference G-quadruplex. Using cellular assays, together with polyamine-depleting and quadruplex-stabilizing ligands, we discovered how some of these motifs regulate and sense polyamine levels, creating feedback loops during polyamine biosynthesis. Using high-resolution 1H-NMR spectroscopy, we demonstrated that a long-looped quadruplex in the AZIN1 mRNA co-exists in salt-dependent equilibria with a hairpin structure. This study expands the repertoire of regulatory G-quadruplexes and demonstrates how they act in unison to control metabolite homeostasis. Polyamines (PAs) are small poly-cationic molecules present at millimolar concentrations in cells (Lightfoot and Hall, 2014). In mammals, the dominant PAs are spermine and spermidine. PAs play critical roles in many processes but their mechanistic workings are rarely investigated and are poorly understood (Miller-Fleming et al., 2015). In cells, PAs bind nucleic acids in two ways: with un-specific interactions where they diffuse relatively freely around the polynucleotide, and with site-specific chelation in defined binding pockets with associated function. Levels of PAs are controlled on multiple levels, including synthesis, inter-conversion and depletion (Figure 1a) (Casero and Pegg, 2009; Pegg, 2009), as well as uptake and efflux (Abdulhussein and Wallace, 2014). Furthermore, PA-directed feedback loops operate at RNA and protein levels, whereby low levels of PAs are corrected with increased expression of PA synthesis enzymes and decreased activities of negative regulators (Miller-Fleming et al., 2015; Ivanov et al., 2010; Perez-Leal and Merali, 2012). For instance, several PA synthesis proteins (PSPs) (AZIN1, AMD1, PMOX, ODC1, SAT1) are subject to PA-mediated regulation via short open reading frames (uORFs) (Ivanov et al., 2010). For example, ODC1 is the limiting factor in PA synthesis (Miller-Fleming et al., 2015): it has a highly structured 5’UTR and its translation is strongly affected by PA levels. 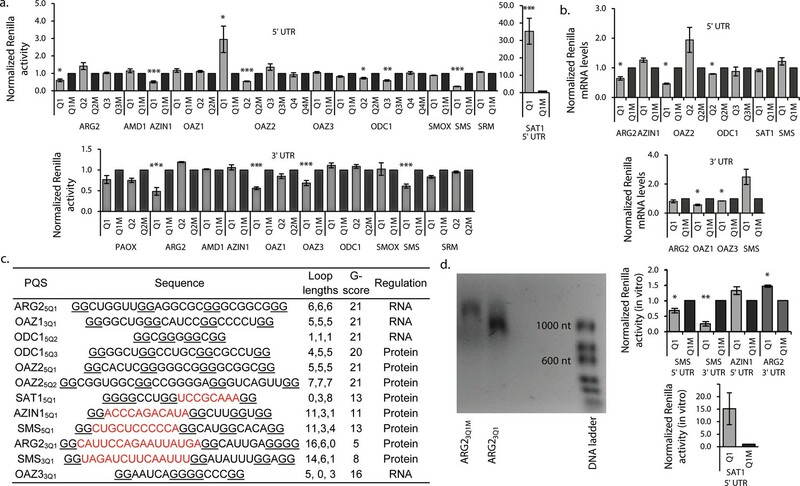 It is also negatively regulated by binding to OAZ proteins, which themselves are regulated by binding AZIN1. PAs bind to nascent OAZ polypeptides, activating a frameshift needed for production of full-length OAZ (Ivanov et al., 2010; Kurian et al., 2011). A considerable part of gene regulation is controlled by secondary/tertiary structures in UTRs (Wan et al., 2011). Examples of structures are stem-loops, pseudoknots and riboswitches, which serve as sensors, reacting rapidly to inputs such as changes in the concentrations of RNA binding proteins (RBPs), metabolites, or even changes in temperature (Wan et al., 2011). The intramolecular G-quadruplex consists of stacked guanine tetrads connected by three loops (Millevoi et al., 2012) (Figure 1b). They self-assemble through Hoogsteen binding and π-π interactions, stabilized by metals or proteins. The stability of G-quadruplexes is governed by the number of G-quartets, the loop length and composition, the flanking nucleotides and salt conditions. Although their structures are difficult to characterize in vivo, G-quadruplexes are recognized as important elements regulating gene expression (Rhodes and Lipps, 2015; Millevoi et al., 2012), and they are increasingly linked to diseases (Thandapani et al., 2015; Conlon et al., 2016). Two recent genome-wide studies identified thousands of such motifs, the majority of which comprised canonical short-looped G3-tracts (G3-quadruplexes) (Kwok et al., 2016a; Guo and Bartel, 2016). In the latter study, the authors presented evidence that stable G3-quadruplexes (i.e. strong enough to stall reverse transcriptase) in eukaryotic cells were frequently unwound; this suggested the physiological relevance of quadruplex structures should not be automatically inferred from their stability (Guo and Bartel, 2016). Consistent with this, several hundred putative metastable RNA G2-quadruplexes have also been predicted throughout the transcriptome (Kwok et al., 2016a). So far, few G2-quadruplexes have been studied in detail biophysically, structurally and functionally, all of which carry short loops that are ≤7 nucleotides (nt) in length (Mullen et al., 2012; Morris et al., 2010; Cammas et al., 2015; Kralovicova et al., 2014; Murat et al., 2014; Blice-Baum and Mihailescu, 2014; Weldon et al., 2017). 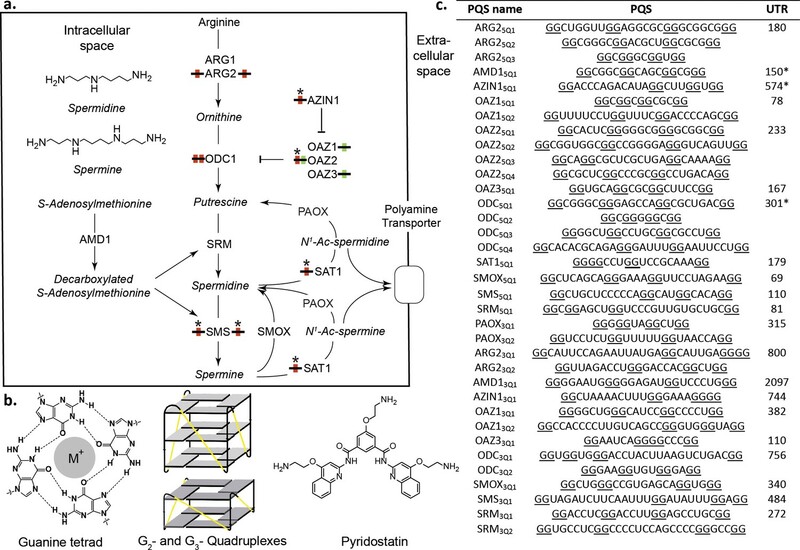 (a) PA biosynthesis pathway and summary of the roles/regulation of putative quadruplex sequences (PQS’s) on PA biosynthesis. Red: G2-rich motifs inhibit PA biosynthesis; Green: G2-rich motifs enhance PA biosynthesis; *: PA-sensing G2-rich motifs. (b) Guanine tetrad stabilized by a monovalent cation (M+) and intramolecular parallel G2- and G3-quadruplexes. Quadruplex loops - yellow. (c) G2-rich motifs in the UTRs of PSPs. PQS’s are denoted as the gene name with the UTR and PQS number (Qn; where n=≥1). Underlined guanines are those forming the most stable predicted G2-PQS from all possible PQS’s predicted by QGRS Mapper (version: Feb. 2014). Full length UTRs were utilized in the study in all cases except for the 5 UTRs of AMD1, AZIN1 and ODC1. *portion of the UTR used in this study for AMD1, AZIN1 and ODC1 (AMD1: 150-AUG; AZIN1: 720-241 and 95-AUG; ODC1: 301-AUG) (See Supplementary file 1 and Supplementary file 2 for details). ARG1, ARG2: arginase 1-2; ODC1: ornithine decarboxylase; SRM: spermidine synthase; SMS spermine synthase; AMD1: adenosylmethionine decarboxylase 1; AZIN1: antizyme Inhibitor 1; OAZ1-3: ornithine decarboxylase antizyme 1-3; SAT1: spermidine/spermine N1-acetyltransferase 1; SMOX: spermine oxidase; PAOX: polyamine oxidase. We identified 35 G2-tract putative quadruplex structures (PQS’s) in the 5’- and 3’UTRs of genes in the polyamine biosynthesis pathway (PSP). Using cellular reporter assays we showed that twelve of these covering eight PSPs altered reporter activity in comparison to mutants. Strikingly, most of the PQS’s increased or reduced reporter expression such that in the setting of their native UTRs they would reduce PA levels. This suggested they might act in unison as regulatory elements to control PA homoeostasis. Using a comprehensive set of independent in vitro biophysical methods, we generated strong supporting data for seven quadruplexes. 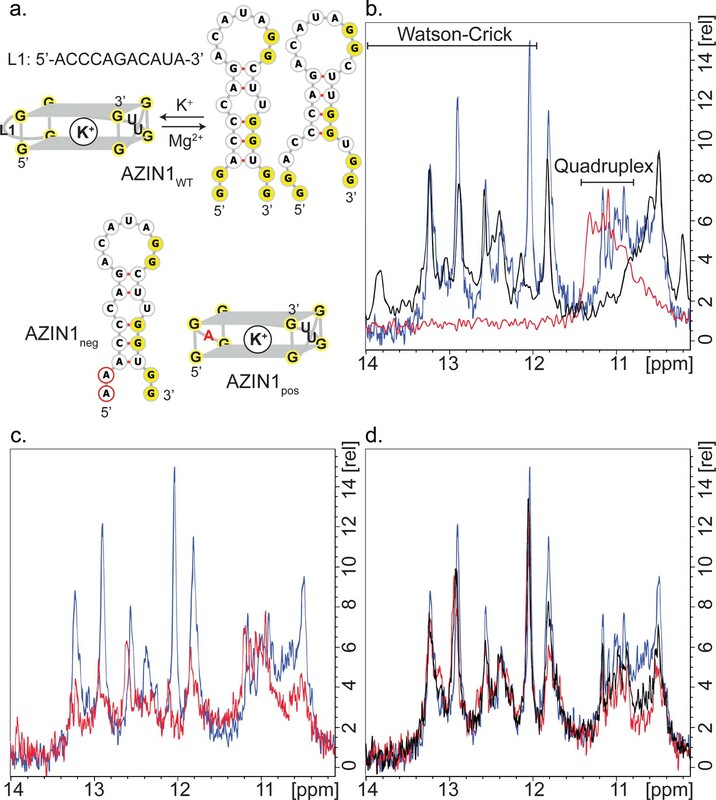 These included a long-looped conserved quadruplex in the AZIN1 mRNA, which we demonstrated with high-resolution NMR spectroscopy, coexists in a salt-dependent equilibrium with hairpin structures. The activities of four PQS’s from OAZ2, AZIN1 and SMS correlated with the levels of PAs in cells, suggesting that these G2-PQS’s respond to PA levels by an undetermined mechanism(s) in feedback loops. Overall, these findings reveal a previously unrecognized additional mechanism of PA self-regulation involving the entire pathway. We expect that such mechanisms through G-quadruplexes may be a common feature in other metabolic pathways. We searched for PQS’s in the UTRs of PSPs (Figure 1a) using the algorithm QGRS Mapper (Kikin et al., 2006), which predicts the ability of a sequence containing G-repeats to fold into (in many cases several) distinct quadruplexes and assigns them a stability score (G-score) based on published biophysical data. Canonical G3-quadruplexes are highly stable in vitro (Wieland and Hartig, 2007; Pandey et al., 2013) and arguably could be considered as ‘thermodynamic sinks’ that are unsuitable for fast structural changes during regulation of gene expression. Therefore, to identify more dynamic analogues in PSP UTRs, we applied a weak minimum consensus sequence (G quartets ≥ 2; total PQS sequence length ≤30) as search criteria. No G3-tract PQS’s (G3-PQS: i.e. with the potential to form a G3-quadruplex structure) were found by the algorithm in the UTRs. Intriguingly however, it revealed 20 G2-PQS’s across eleven 5’UTRs, and 15 G2-PQS’s in ten 3’UTRs of PSPs (Figure 1c). Within many of the UTRs multiple overlapping G2-PQS’s were predicted and QGRS Mapper highlighted the PQS expected to form the most stable quadruplex structure. It seemed plausible that equilibria might exist between distinct PQS's within these G2-rich regions, possibly influenced by local conditions. To help assess if these G2-containing motifs are functional in cells, the UTR containing the PQS (Figure 1c) was cloned 5’- or 3’- to the Renilla luciferase coding region in a dual luciferase reporter plasmid. Dual reporter assays are a preferred means (Halder et al., 2012) to investigate the function of putative G-quadruplexes in cells. Using full-length UTRs where possible, the properties of a putative regulatory element are investigated by comparison to those of a minimally-mutated control. Thus, we mutated or deleted a minimum number of selected guanines in each PQS so as to prevent the principal PQS, as well as alternative quadruplexes, from forming in the control reporters. During the design we were similarly mindful of recent reports that nucleobases other than G, or even a G-vacancy may substitute for G in a quadruplex (Švehlová et al., 2016; Li et al., 2015) (Supplementary file 1). The influence of each PQS on reporter activity was then assessed by comparison with its respective control after plasmid transfection into HeLa cells. Eight from 20 PQS’s in the 5’UTRs of PSPs affected reporter gene activity. Mutation of PQS’s from ARG2 (ARG25Q1: 40%), AZIN1 (AZIN15Q1: 49%), SMS (SMS5Q1: 75%) and ODC1 (ODC15Q2: 28%; ODC15Q3: 41%) increased Renilla activities (Figure 2a). Therefore, these PQS’s inhibit gene expression and in their natural 5’UTRs would be expected to suppress PA levels. SAT1 and OAZ2 are negative regulators of PA synthesis. In cells, translation of SAT1 is increased in response to high PAs (Casero and Pegg, 2009), possibly through an uORF and/or a stem-loop in its coding region (Perez-Leal and Merali, 2012) (Supplementary file 1). Its most stable predicted quadruplex (SAT15Q1) is conserved in mouse (Figure 2—source data 1) and is unusual because it contains no first loop: parallel intramolecular G3-quadruplex structures containing no first loop in DNA were recently described and characterized using a combination of biophysical techniques (Piazza et al., 2017). (Figure 1). Surprisingly however, we found that mutation of three nucleotides in this PQS reduced Renilla activity by >30 fold, implying that this G2-PQS contributes strongly to SAT1 regulation. OAZ2 has four PQS’s in its 5'-UTR (Figure 1c): mutation of OAZ25Q1 inhibited Renilla activity (195%), whereas mutation of OAZ25Q2 enhanced activity (46%). Thus, these PQS’s might influence PA synthesis in context-dependent fashion. Mutations in four PQS’s in the 3'-UTRs of PSPs increased Renilla activities (ARG23Q1: 52%; OAZ13Q1: 44%; OAZ33Q1: 31%; SMS3Q1: 39%). Accordingly, in their natural environments PQS’s from ARG2 and SMS 3’-UTRs would also act as inhibitors of PA synthesis. G2-PQS’s regulate luciferase reporter genes. (a) Effect of PQS’s from PSP UTRs on Renilla luciferase activity in HeLa cells; PQS's ARG25Q1, AZIN15Q1, OAZ25Q1, OAZ25Q2, ODC15Q2, ODC15Q3, SMS5Q1, SAT15Q1, ARG23Q1, OAZ13Q1, OAZ33Q1 and SMS3Q1 show a statistically significant difference to their mutated controls (n = 3–7; *p≤0.05, **p≤0.01, ***p≤0.001); remaining PQS's are designated as inactive (n>/=2); error bars represent standard error (SE)). (b) Effect of functional PQS’s on Renilla mRNA levels in HeLa cells by qRT-PCR (n = 3–4, *p≤0.05; error bars represent standard error (SE)). (c) Properties of the functional G2-PQS’s. Underlined: predicted G-tetrad as in Figure 1c. Red, bold: long (>7 nt) loops. (d) Effects of G2-PQS’s on in vitro translation of Renilla luciferase in HeLa lysates (n = 3, *p≤0.05, **p≤0.01) (high variability of the SAT15Q1 was noted between different lysate batches). The effect of ARG23Q1 on in vitro transcription of Renilla luciferase. (See Figure 2—figure supplement 1). Error bars represent standard error (SE). Percentage changes discussed in the text are calculated as differences in normalized Renilla counts (x100). In summary, 12 G2-PQS’s from the 5’-UTRs (ARG2, AZIN1, OAZ2, ODC1, SMS), and the 3’-UTRs (ARG2, SMS, OAZ1, OAZ3) altered reporter expression (ten inhibited, two induced). In their native UTRs, nine of these would suppress levels of PAs (summarized in Figure 1a), providing a potentially powerful level of structure-based regulation throughout the pathway. Conservation of RNA structure across species is indicative of function, though the study of quadruplex sequence covariation is still in its infancy (Švehlová et al., 2016). We therefore assessed the conservation of these PQS's using H-QGRS (Menendez et al., 2012), where conservation is measured by factors such as composition, location and predicted stability. Eight G2-PQS's are conserved (AZIN15Q1, SMS5Q1, ODC15Q2, SAT15Q1) between mouse and human or primate and human (SMS3Q1, ARG23Q1, ODC15Q3 and OAZ33Q1) (Figure 1), under highly stringent conservation conditions. We investigated further these 12 motifs with a wide range of assays to provide further insight into their functions. Quadruplexes are capable of altering gene expression through their influence on numerous cellular processes including replication, transcription, splicing, mRNA localisation and translation (Rhodes and Lipps, 2015). To determine if effects observed in the reporter assays (Figure 2a) originated at the mRNA levels, we assayed Renilla mRNAs by qRT-PCR. 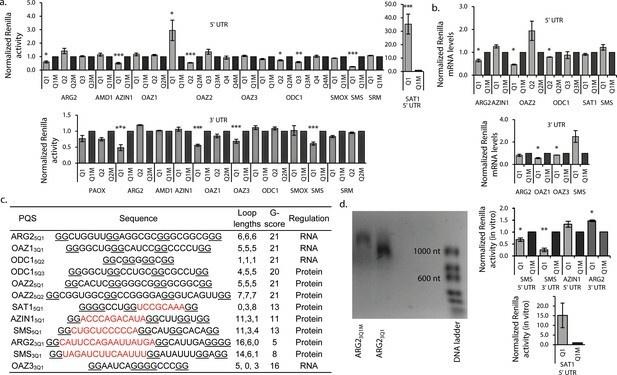 No significant differences were seen in mRNA levels between reporter and their matched controls for AZIN15Q1, OAZ25Q2, ODC15Q3, SAT15Q1, SMS5Q1, SMS3Q1 and ARG23Q1 (Figure 2b). This suggested that activities in the reporter assays possibly originated at the protein level. For OAZ25Q1 reporter activity and mRNA levels were inversely correlated. ARG25Q1, ODC15Q2, OAZ13Q1 and OAZ33Q1, which all suppressed Renilla activity (Figure 2a), also suppressed the corresponding mRNAs (by 36, 12, 43 and 16%, respectively), consistent with regulation by these four PQS’s at least partly at the mRNA level (e.g. transcription). Analysis of the functional PQS sequences suggested seven of the PQS’s (ARG25Q1, OAZ13Q1, ODC15Q2, ODC15Q3, OAZ25Q1, OAZ25Q2, OAZ33Q1) likely form quadruplexes with short loops (Figure 2c). Their predicted stabilities according to the G-score function QPARS (Kikin et al., 2006) (G-score: 16–21) are typical for G2-quadruplexes (Figure 2c). The remaining five, which inhibited reporter activity at the protein level, each have one unusually long loop (8–16 nt), and show correspondingly low G-scores (5–13: Figure 2c). Three of these G2-PQSs are conserved (AZIN15Q1, SAT15Q1 and SMS5Q1) between mouse and human, as well as zebrafish in the case of SMS5Q1 (Figure 2—source data 1). We performed in vitro translation assays on the five PQS’s which comprise one long loop (8–16 nt) and functioned at the post-transcriptional level (AZIN15Q1, SAT15Q1, SMS5Q1, SMS3Q1 and ARG23Q1). Reporter mRNAs were in vitro-transcribed and -translated in HeLa lysates (Figure 2d, Figure 2—figure supplement 1). Compared to matched controls, SMS5Q1 and SMS3Q1 transcripts produced less Renilla activity (28–61%), whereas the SAT15Q1 transcript produced 14-fold more activity, fully consistent with their activities in cells (Figure 2a,b). Results from the assays suggested that AZIN15Q1 does not affect translation in this context (vide infra). For ARG23Q1 we observed a short transcript which appeared to terminate proximal to the PQS (Figure 2d), possibly explaining its unexpected performance during in vitro translation. Indeed, examples of quadruplex structures in 3’UTRs which induce transcription termination have been previously reported (Kuzmine et al., 2001; Wanrooij et al., 2010). Multiple experimental techniques are needed to provide conclusive evidence for G-quadruplex formation in vitro (Lane et al., 2008). Typically, a PQS is embedded in a short oligoribonucleotide, where it is assumed to fold similarly to its native state independent of flanking sequence. In comparison to a mutated control, the RNA is then characterized for migration by native polyacrylamide gel electrophoresis (PAGE), by ultraviolet (UV)-melting, by circular dichroism (CD) and by staining with Thioflavin T - the gold standard for monitoring unusual RNA quadruplex structures, which fluoresces upon stacking to RNA G-tetrads and distinguishes quadruplexes from single-stranded- and stem-loop RNAs (Xu et al., 2016). We studied four canonical G2-PQS’s (ARG25Q1, OAZ25Q1, OAZ25Q2 and ODC15Q2; G scores:~21) and five irregular long-looped G2-PQS’s (SMS5Q1, SMS3Q1, ARG23Q1, SAT15Q1, AZIN15Q1) with much weaker predicted stability (G scores: 5–13). We optimized conditions for the assays using a well-characterized G-quadruplex from the 5’UTR of NRAS (NRASwt; G-score: 40) (Kumari et al., 2007). NRASWT and its mutated control (NRASM) migrated by PAGE as single bands at different rates (Figure 3). Upon staining the gel with Thioflavin T, NRASWT emitted a higher fluorescence than NRASM. The UV melt/anneal profile of NRASwt showed a reversible negative melting transition (TM 295) typical of intramolecular G-quadruplexes (whereas no transition was observed for NRASM; Figure 3—figure supplement 1). Its CD spectrum displayed a peak at 268 nm and a trough at 239 nm, consistent with a quadruplex or a stem, whereas NRASM produced a peak at 273 nm, indicative of unfolded RNA. The four canonical G2-PQS’s ARG25Q1, OAZ25Q1, OAZ25Q2 and ODC15Q2 performed similarly to NRASwt in all of the assays confirming quadruplex structures (Figure 3, Figure 3—figure supplement 1). Taken together, the data provided strong supporting evidence for control of PA synthesis by G2-PQS’s at several points in the PA pathway. Biophysical properties of G2-PQSs from PSPs: Gel migration, Thioflavin T fluorescence, UV (295 nm), CD. All biophysical studies were performed in 100 mM K+. PAGE migration and Thioflavin T staining were performed at different migration times on distinct gels. Melting temps (TM 295) are shown in the plots; a K+-effect (1 mM and 100 mM K+) on TM 295 was found for ARG25Q1 (+18.8°C), OAZ25Q2 (+20.9°C) and SMS5Q1 (+18.4°C); mutated controls ARG25Q1M, OAZ25Q1M, SMS5Q1M, AZIN15QM1, AZIN15QM2, AZIN15QM3, did not show any (TM 295) melting transitions (data not shown and Figure 3—figure supplement 1; Figure 5—figure supplement 3). CD measurements were not performed for ARG23Q1 due to the presence of multiple RNA species. Error bars represent the standard error (SE) from two independent replicates. (Gels in this figure were cropped: full length gels are in Figure 3—figure supplement 3 and 4. The aforementioned biophysical techniques are less established for irregular quadruplexes, where the structural heterogeneity of long loops and the potential for alternative structures alter typical quadruplex behaviour, for example, shifting peaks to higher wavelengths in CD spectra (Pandey et al., 2013; Bolduc et al., 2016). Long-looped SMS5Q1 and SMS3Q1 migrated differently to their controls on PAGE as single bands (Figure 3 and Figure 3—figure supplement 2 resp.). Furthermore, Thioflavin T staining produced greater fluorescence emission for SMS5Q1 and SMS3Q1 RNAs than their controls. 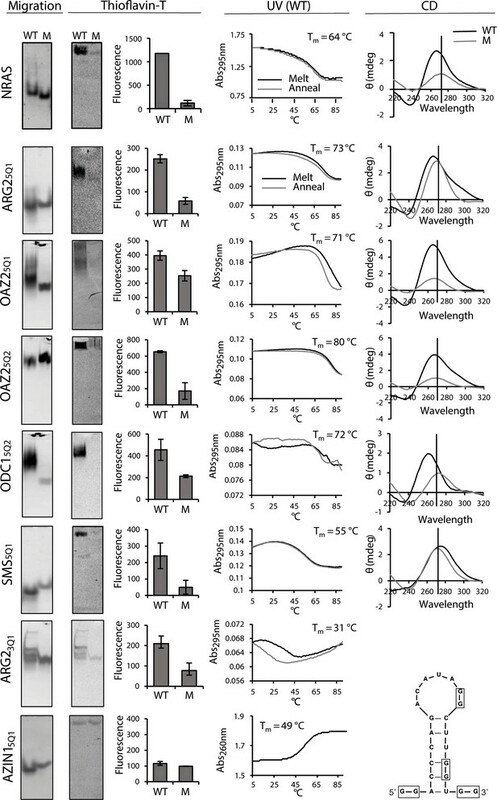 A reversible UV melting transition (ΔAbs: ~0.2) with potassium-concentration dependence provided additional evidence of quadruplex formation for SMS5Q1 RNA (Figure 3) and not for SMS5Q1M (Figure 3—figure supplement 1), and SMS5Q1 and SMS5Q1M RNAs produced distinct CD spectra with peaks at 278 nm and 273 nm respectively. Together, the data for SMS5Q1 provided strong evidence that natural long-looped G2-quadruplexes can form in vitro, and provided a reference profile for such structures. For the weakly-stable SMS3Q1 (G-score: 8; 14-nt loop), the CD spectra, the gel migration and the Thioflavin T staining obtained from SMS3Q1 and SMS3Q1M confirmed distinct properties for these two short synthetic oligoribonucleotides (Figure 3—figure supplement 2) but no UV melting transition was observed, possibly due to limitations of this technique for observing transitions, as proposed previously for similar model structures (Pandey et al., 2013). ARG23Q1 produced multiple bands consistent with multimeric structures on PAGE, which migrated more slowly than ARG23Q1M. Nevertheless, staining with Thioflavin T produced a higher fluorescence for ARG23Q1 and its UV melting profile showed a melting transition typical for a G-quadruplex (with hysteresis) (Figure 3), whereas no transition was observed for ARG23Q1M (Figure 3—figure supplement 1). SAT15Q1 RNA also migrated more slowly by PAGE than its control. Although it fluoresced upon Thioflavin T staining, no negative transitions were observed upon UV melting. Its CD spectrum displayed a peak at 264 nm and a trough at 237 nm, whereas SAT15Q1M was unfolded (Figure 3—figure supplement 1). From this data it may be assumed that SAT15Q1 and ARG23Q1, with their two loops and GGGG tracts embedded in these small oligoribonucleotides, are possibly forming intermolecular (quadruplex) structures. Finally, AZIN15Q1 migrated faster than its control on PAGE, and its CD spectrum indicated base pairing (peak: 268 nm; trough: 233 nm), whereas its control was unfolded. However, AZIN15Q1 produced no fluorescence on Thioflavin T staining and no clear transition during UV melting at 295 nm (Figure 3, Figure 3—figure supplement 2), casting doubt on a G2-quadruplex structure. On the other hand, UV melting at 260 nm produced a TM of 49°C (Figure 3), suggesting that AZIN15Q1 RNA formed a structure with Watson–Crick base-pairs. This was supported by a mFOLD analysis of the AZIN15Q1-containing sequence, which yielded a stable stem-loop structure (Figure 3). In summary, a variety of measurements added strong supporting evidence that short-looped G2-PQS’s, and at least one of the long-looped G2-PQS’s formed quadruplexes in vitro. Short oligoribonucleotides containing SAT15Q1 and ARG23Q1 possibly formed intermolecular quadruplex structures. For the two other G2-PQS’s the data was either inconclusive, possibly reflecting the limitations of in vitro methods (i.e. SMS3Q1) or other competing structures dominated in vitro possibly due to the absence of auxiliary factors present in cells (i.e. AZIN15Q1). Therefore, we looked for evidence for these long-looped quadruplex structures in cells. A common means to probe the functionality of a PQS in cells is with pyridostatin (PDS) (Bugaut et al., 2010; Murat et al., 2014), a ligand which binds to many RNA quadruplexes. When used at micromolar concentrations in vitro, this ligand usually stabilizes quadruplexes. In order to provide further insight on the importance of RNA quadruplexes on PA regulation, we treated cells with PDS, where stabilization of the aforementioned G2-PQS's would be expected to show suppression of PA levels. Using a standard cell viability assay and monitoring β-actin levels, we first established that PDS could be used without toxicity in HeLa cells at concentrations up to 128 μM (Figure 4—figure supplement 1). We then treated cells with PDS and assayed intracellular PAs using a protocol in which PAs from cell lysates are quantified by analytical HPLC (Morgan, 1998). Indeed, we found that low micromolar concentrations of PDS strongly reduced spermidine and spermine levels in cells by 70-80% (Figure 4a, Figure 4—figure supplement 2). To determine whether these effects were due to changes in levels of PSPs, we assayed endogenous SMS and AZIN1 proteins, both of which are expressed in HeLa cells and for which good antibodies are available. PDS treatment produced a 50% decrease in endogenous SMS protein (Figure 4b). Next, to examine whether SMS5Q1 and SMS3Q1 might have contributed to this outcome, we tested PDS on the SMS5Q1 and SMS3Q1 reporter genes. These assays provided an additional information: they enabled comparison of the effects of stabilizing (increasing) G2-PQS function (with PDS), with the effects of abolishing G2-PQS function by mutation (Figure 2a). Indeed, PDS treatment of cells transfected with both SMS5Q1 and SMS3Q1 reporters dose-dependently reduced luciferase activity by 20-30% compared to matched controls (Figure 4b, Figure 4—figure supplement 3), as expected for quadruplexes which suppress gene expression, and fully consistent with the effects of mutating SMS5Q1 and SMS3Q1 (Figure 2a). Taken together, the experiments provided evidence in cells that the suppression of PAs by quadruplex-stabilizing PDS (Figure 4a) was consistent with reduced SMS protein, and this may have been at least partly due to the additive action of G2-motifs SMS5Q1 and SMS3Q1 in its UTRs. PDS (64 μM) yielded a 100-150% increase in both endogenous AZIN1 protein and the AZIN15Q1 reporter (relative to AZIN15Q1M) (Figure 4c, Figure 4—figure supplement 3). This regulation under reduced polyamine conditions (Figure 4a) was in the opposite direction to that of mutating AZIN15Q1 under normal polyamine conditions (Figure 2a). Hence, rather than stabilizing the quadruplex we were possibly observing a strong feedback response to global PA suppression by PDS, whereby cells activated AZIN1 in order to raise PA levels, at least partly via the AZIN15Q1 element. Self-regulation and feedback mechanisms are strong features at multiple points in the PA biosynthesis (Miller-Fleming et al., 2015; Ivanov et al., 2010; Perez-Leal and Merali, 2012). We therefore investigated whether PAs also self-regulate via any of the G2-PQS’s in PSP mRNAs. It is well established that under physiological conditions, cells resist uptake of PAs via their transporter pathways (Wallace and Keir, 1986). Nevertheless, we examined the effects of PA addition (a mix of putrescine, spermine and spermidine at 0.01-1 mM concentrations) to cells expressing a selection of G2-PQS reporters (Figure 4—figure supplements 5 and 6). We observed small reproducible statistically-significant decreases in Renilla activity from the AZIN15Q1, SMS5Q1 and SMS3Q1 reporters after normalization to matched controls, while SAT15Q1 and OAZ25Q1 responded with increased luciferase (Figure 4d, Figure 4—figure supplements 5 and 6). Once again, given that AZIN1 and SMS drive PA synthesis and SAT1 and OAZ2 are suppressors of PAs (Figure 1a), this data also suggested that these motifs participate in feedback loops, whereby cells attempt to maintain normal levels of PAs in the presence of high concentrations of exogenous polyamines. Next, we turned to two ligands which deplete cells of PAs by distinct mechanisms: D,L-α-difluoromethylornithine (DFMO), which inhibits ODC1, and N-(3-aminopropyl)-cyclohexylamine (APCHA), which inhibits SMS. Consistent with expectations, levels of spermine and spermidine were reduced significantly (to 32 and 24%, respectively) in HeLa cells following combined treatment with DFMO (500 μM) and APCHA (100 μM) for 5 days (Figure 4e, Figure 4—figure supplement 7). Notably, ligand treatment did not change luciferase activity from most reporter plasmids, which was generally very stable after normalization to matched controls (Figure 4—figure supplements 5 and 6 and data not shown). However, the ligands increased the activity of AZIN15Q1, and SMS3Q1 reporters (114 and 16% respectively), and decreased activity of OAZ25Q1 (81%), compared to controls (Figure 4f) (we were unable to assess effects on SAT15Q1 because of too low luciferase counts from SAT15Q1M). To confirm that these effects were due to ligand-induced PA suppression, and not unspecific toxicity, we performed a rescue in which the spermine/spermidine mix was added to the drug-treated cells. The PA mix reversed the effects of the ligands on luciferase counts from AZIN15Q1, SMS3Q1 and OAZ25Q1 compared to the controls (Figure 4f), and it had no effect on reporters which were unaffected by the ligands (Figure 4—figure supplements 5 and 6). Taken together, this further provided evidence that PAs self-regulate through a sub-set of canonical and long-looped G2-PQS’s in AZIN1, SAT1, SMS and OAZ2. Other PQS’s may also perform similar roles. G2-PQS in PSPs form quadruplexes in Hela cells and self-regulate. (a) Effects of pyridostatin (PDS) on spermine and spermidine (n=3, *p≤0.05, **p≤0.01). (b) Effects of PDS on endogenous SMS protein at 6 and 24 h (n=3, *p≤0.05, **p≤0.01) (full length blots are in Figure 4—figure supplement 4); effects on SMS5Q1 (n=3, *p≤0.05) and SMS3Q1 (n=3-5, **p≤0.01, ***p≤0.001) wild-type and mutant reporter gene expression (UT: untreated); (c) Effects of PDS on endogenous AZIN1 protein at 24 h (n=3, *p≤0.05) (full length blots are in Figure 4—figure supplement 4); effects on AZIN15Q1 wild-type and mutant reporter gene expression (n=6, *p≤0.05). (d) Effect of PA supplementation on reporter activity from PQS’s in HeLa cells (n=3, *p≤0.05, **p≤0.01). (e) Effect of DMFO and APCHA on levels of spermine and spermidine in HeLa cells. Two independent replicates were performed. (f) Effect of PQS’s from PSPs on reporter activity in HeLa cells under PA depletion (0.5 mM DFMO, 100 µM APCHA, 6 days) followed by PA rescue (0.5 mM DFMO, 100 µM APCHA, 6 days, 100 µM PA, addition day 5). (n=3-5, *p≤0.05). Error bars represent standard error (SE) from at least two independent replicates. See Figure 4—figure supplements 5, 6 and 7. 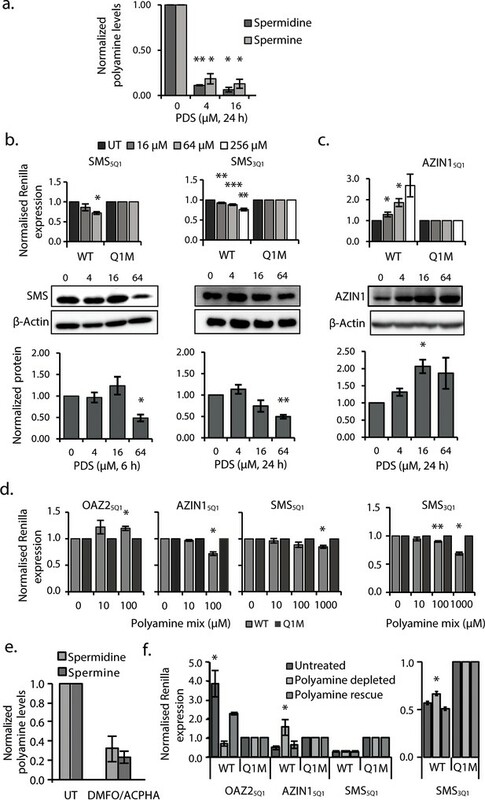 The robust response of the conserved G2-PQS AZIN15Q1 in cells to mutation, to changes in polyamine levels and to PDS treatment suggested that it may play a prominent role in regulation of polyamine levels. Structure predictions by QGRS Mapper and M-Fold suggested that it might adopt both a G-quadruplex and a hairpin structure, which prompted us to investigate it in further detail, since others have described how RNAs can equilibrate between stem loop and G-quadruplex structures in cation-dependent fashion (Pandey et al., 2015; Mirihana Arachchilage et al., 2015; Kwok et al., 2016b; Olsthoorn, 2014). The formation of RNA G-quadruplexes is usually stabilized by K+ (Lane et al., 2008), whereas RNA hairpins and duplexes are favoured in the presence of Na+ and Mg2+ (Nakano et al., 2007; Tan and Chen, 2008). Hence, we studied the structural behaviour of AZIN15Q1 (herewith denoted as AZIN1wt for the NMR study), using high-resolution NMR spectroscopy, where we recorded the chemical shifts of its imino proton signals in the presence of different cations. Imino signals at 12–14 ppm are characteristic for Watson-Crick base pairs. The imino signals at approximately 10–12 ppm are characteristic for guanine imino protons involved in H-bonds derived from GU base pairs or from Hoogsteen-like interactions with the oxygen containing acceptor groups of another guanine in the context of G-quadruplexes (Jin et al., 1990; Wang et al., 1991a, 1991b; Smith and Feigon, 1992; Bahrami et al., 2012; Bugaut et al., 2012). We recorded 1D 1H NMR spectra of the five short-looped PQS's (NRAS control, ARG25Q1, OAZ25Q1, OAZ25Q2, ODC15Q2) and the long-looped, less stable SMS5Q1 for which biophysical data (Thioflavin T staining and UV295-melting; Figure 3) indicated the presence of quadruplex structures. All of the short-looped PQS's returned spectra with signals around 11 ppm consistent with G-quadruplex structures (Figure 5—figure supplement 1), whereas SMS5Q1 did not show signals in this region, likely because of the differing conditions needed/used for NMR experiments compared to the alternate assays (i.e. 500 µM versus 4 µM). We then measured 1H NMR spectra of AZIN1wt. The number and position (10.5–13.5 ppm) of the imino signals suggested the presence of multiple structures containing both Watson-Crick and Hoogsteen signals (Figure 5a and b). When we increased the concentration of KCl (from 100 to 200 mM), we observed a decrease in intensity for the Watson-Crick imino signals (12–13.4 ppm), but not for those in the Hoogsteen region, consistent with a shift to a quadruplex conformation under increased K+ concentrations (Figure 5c). We also performed measurements at 100 mM NaCl or 2 mM MgCl2. In both cases, we observed disappearance of the imino peaks located at 10.8–11.2 ppm, whereas the signals at 11.2–13.5 ppm remained, consistent with the loss of this G-quadruplex and concomitant formation of a double-stranded structure (Figure 5—figure supplement 1) (Bugaut et al., 2012). (a) Derived model for the equilibrium between two possible hairpin conformers and the G2-quadruplex of AZIN1wt; K+ is expected to favor the G2-quadruplex; Na+ or Mg2+ are expected to favor the hairpin conformers, which are predicted by Mfold with free energies ΔG of −2.5 (left) and −1.8 kcal/mol (right). The mutants AZIN1neg and AZIN1pos were designed to stabilize the hairpin conformation and the G2-quadruplex, respectively: note the mutation of the first G2-tract at the 5’-end in AZIN1neg and the difference of the G2-quadruplex in the first loop from 5’-end (L1) for AZIN1pos. Sites of mutation are marked in red. (b) Overlay of 1H NMR spectra corresponding to the imino region of AZIN1wt (blue), AZIN1neg (black) and AZIN1pos (red) in 100 mM KCl (0.1 mM RNA). (c) Overlay of 1H NMR spectra corresponding to the imino region of AZINwt in 100 mM KCl (blue) and 200 mM KCl (red). (d) 1H NMR spectra after titration of spermine (Spm) to AZIN1wt in 100 mM KCl. Before addition of Spm (blue); after addition of Spm at RNA:Spm ratio of 1:1 (black) and 1:2 (red). Note the stronger decrease of the imino signals < 12 ppm. In order to provide additional independent evidence that the signals at 10.8–11.2 ppm indeed derived from a quadruplex conformer, we measured spectra for two mutant sequences. We substituted the first G2-tract at the 5´-end of AZIN1wt with adenines to give AZIN1neg, thereby preventing formation of an intramolecular G-quadruplex (Figure 5a). Indeed, peaks between 10.8–11.2 ppm disappeared in the 1H NMR spectra (Figure 5b). In the second mutant AZIN1pos (Figure 5a), the 11-nt long loop was exchanged for a single adenine. This was expected to yield a more stable G2-quadruplex with a shorter loop and prevent the formation of a stem (Figure 5a) (Pandey et al., 2013; Zhang et al., 2011). Indeed, the spectra of AZIN1pos yielded imino signals in a narrow window between 10.8–11.4 ppm, and none in the presumed stem region (Figure 5b). Furthermore, superimposition of spectra from AZIN1wt and AZIN1pos revealed substantial overlap in the presumed quadruplex-specific region, supporting the presence of the G2-quadruplex conformer at 100 mM KCl. The small shift downfield of the imino peaks for AZIN1pos might have resulted from an altered environment due to the absence of the long loop L1. To confirm that the peaks in our spectra around 11 ppm with AZIN1wt were indeed from G imino-protons, we in vitro-transcribed an 15N-labeled version of AZIN1wt and recorded a 1H-15N HSQC (Figure 5—figure supplement 2). Similarly to what was previously reported for RNA G-quadruplexes (Nasiri et al., 2016), we observed that these protons were bound to 15N atoms with a chemical shift of about 145 ppm. This chemical shift is characteristic of a guanine N1 atom bearing a proton involved in a G-quadruplex or GU base-pairing. Imino protons of GU base pairs can be assigned by a 1H-1H 2D NOESY, due to strong NOE's between the imino protons of the guanine and the uridine; in addition, U imino protons in the 1H-15N HSQC are expected at approximately 160 ppm for N3. Since neither strong imino-imino NOE's nor H3-N3 imino cross-peaks were observed in our spectra (Figure 5—figure supplement 2), we concluded that the cross-peaks observed in the 1H-15N HSQC of AZIN1wt between 10–11 ppm in the proton dimension originate from a G-quadruplex structure. G-quadruplexes also produce distinct NOE patterns involving the imino, amino and aromatic protons of the guanine nucleotides (Jin et al., 1992; Macaya et al., 1993; Smith and Feigon, 1992). Typical for a G-quadruplex, NOEs between neighbouring imino groups and also between imino and amino groups (shifted to 9–10 ppm compared to Watson-Crick base-pairs) were present in the 2D NOESY spectrum obtained with AZIN1wt (Figure 5—figure supplement 2), as reported previously (Nasiri et al., 2016). In conclusion, we accumulated evidence for the coexistence of stem structures and a G-quadruplex structure with the AZIN1wt sequence in 100 mM KCl. In addition, we demonstrated that the nature and concentration of metal ions in solution could direct the equilibrium towards either the stem conformers or the G-quadruplex. To our knowledge this is the first report of a mammalian sequence being in equilibrium between stem structures and a non-canonical RNA G2-quadruplex structure with an exceptionally long loop. Data from the experiments in cells (Figure 4) suggested that PAs might regulate an equilibrium between a stem loop and a G2-quadruplex structure in AZIN1wt. Therefore, we also investigated the influence of added spermine on the imino protons of AZINwt. The proximity of spermine amino groups to the imino protons involved in base pairing might be expected to lower the intensity of their signals through exchange. Indeed, a titration of AZIN1wt with spermine to a ratio of 1:2 revealed that increasing polyamine significantly decreased the imino signals of presumed G-U wobble base pairs (at 11.8 and 10.5–10.8 ppm), as well as the G2-quadruplex signal set (at 10.8–11.2 ppm) (Figure 5d) (we were unable to increase the spermine concentration further since at a 1:3 ratio in RNA:Spm precipitation was observed). In addition, we observed small chemical shift perturbations peaks upon spermine addition, which also suggested an interaction. The Watson-Crick imino signals of the hairpin forms (at 12–13.4 ppm) were less affected. Thus, spermine seems to preferentially interact with the quadruplex AZIN5Q1 and G-U parts of the stem-containing structures. Additional supporting evidence for such an interaction of spermine with AZINwt was available from independent in vitro assays. Incubation of AZIN15Q1 (but not three mutated controls) with spermine in the presence of 1 mM K+ produced a new negative melting transition at 295 nm, consistent with a quadruplex structure (ΔAbs: ~0.02; Tm: ~38°C) (Figure 5—figure supplement 3). Long-looped SAT15Q1 showed no such change, whereas a minor effect was seen with SMS5Q1 (not shown). Under the same conditions, the Tm of the presumed stem measured at 260 nm decreased from 49°C to 28°C (Figure 5—figure supplement 3). We also assessed the effects of spermine on AZIN15Q1 and three controls in the Thioflavin T assay (Figure 5—figure supplement 3), with the view that if the presence of spermine stabilized formation of a quadruplex, then fluorescence should be increased. Thioflavin T (4.5 µM) was added to pre-annealed AZIN15Q1 and controls after incubation with spermine. Thioflavin T fluorescence was similar for all four sequences in the absence of spermine. However, in the presence of spermine, AZIN15Q1 fluorescence increased 52%. These data provided additional evidence in vitro that spermine might alter the equilibrium dynamics of AZIN15Q1 substructures, destabilizing the stem structure in order to form a G2-quadruplex. Conformational changes in dynamic RNA structures alter gene expression (Wan et al., 2011; Dethoff et al., 2012). They are triggered by cellular signals such as the binding of RNA helicases, RBPs, and small ligands, which change the energy landscape of the RNA structure after lowering barriers to conformational exchange (Dethoff et al., 2012). The G-quadruplex is one of several important RNA structural elements, that are widespread throughout the transcriptome (Kwok et al., 2016a; Guo and Bartel, 2016), particularly in UTRs (Huppert et al., 2008), where they play roles in transcription termination, polyadenylation, splicing and translation (Millevoi et al., 2012). The canonical G3-quadruplex has short-loops and a compact structure that is extremely stable in the presence of cations (Pandey et al., 2013). For example, its stability correlates with its capacity to inhibit translation from 5'UTRs (Halder et al., 2009) and G3-quadruplexes reportedly need to be unfolded to avoid stalling of reverse transcriptase (Guo and Bartel, 2016; Kwok et al., 2016a). Using methods that would not identify dynamic (i.e. transiently unfolded) quadruplexes or those strongly folded in the absence of potassium, it was shown that canonical quadruplexes are frequently held unfolded in eukaryotic cells by a dedicated machinery (Guo and Bartel, 2016), possibly by specialized helicases (Bugaut and Balasubramanian, 2012). However, examples of irregular G-quadruplexes with uncharacterized structures, lower thermodynamic stabilities (in vitro) and distinct biophysical and electronic properties are increasingly proposed. In particular, recent transcriptome-wide searches have identified large numbers of putative G-quadruplexes with G2- instead of G3-tracts, including structures with long loops and even bulged loops (Kwok et al., 2016a). G2-quadruplexes are less stable than their canonical G3-counterparts, and long intervening loops further lower their stability in model sequences in vitro (Pandey et al., 2013). Indeed, the dynamic character of a metastable G-quadruplex lends itself to participation in equilibria with other secondary or tertiary structures (Zhang and Balasubramanian, 2012) where a change in conformation in response to a signal serves to adjust gene expression. Here, we demonstrated using high resolution 1H NMR spectroscopy one example of such conformational changes under different salt conditions involving the G2-motif present in the 5'UTR of AZIN1. PAs are regulated by an astounding array of unique and conserved mechanisms involving the enzymes and factors of the PSP pathway (Lightfoot and Hall, 2014; Miller-Fleming et al., 2015). Many of these mechanisms center on secondary structures and uORFs in the UTRs of PSP mRNAs, thereby affecting translation. Here we describe 12 G2-PQS’s, several of which likely form G2-quadruplexes, in the 5’- and 3’UTR’s of the PSPs ARG2 (two motifs), ODC1 (two motifs), SMS (two motifs), OAZ2 (two motifs), OAZ3, OAZ1, AZIN1 and SAT1, which were identified using the standard QGRS predictive tool. Seven of them are likely short-looped G2-quadruplexes with typical G-scores. The remainder, which was active at the protein level, all possessed one unusually long loop and returned correspondingly low G-scores. Using matched pairs of wild-type and mutated reporters for each individual G2-PQS, we showed that most of those that affected reporter gene activity would suppress PA synthesis in their native UTR setting (Figure 2). We employed multiple assays on nine PSP G2-PQS’s in vitro, comparing them to a G3-quadruplex reference (Figure 3). The four short-looped G2-PQS’s behaved similarly to the reference providing strong evidence for a quadruplex structure. Three of the long-looped G2-PQS’s (SMS5Q1, ARG23Q1, AZIN15Q1) also showed many characteristics typical of a G-quadruplex in vitro, albeit with lower stabilities. In addition, data from cell assays provided persuasive evidence for the structure and function of long-looped G2-quadruplexes (Figure 4). PDS, a ligand which generally stabilizes RNA G-quadruplexes, altered the expression of reporters containing the G2-PQS’s from SMS and AZIN1 UTRs, and also levels of native SMS and AZIN1 proteins in cells. Small effects (20–30%) on the individual reporters appeared at PDS concentrations of 16–256 µM, however 15-fold lower ligand concentrations sufficed to reduce endogenous spermine and spermidine levels by >70–80%. We took this as a possible indication that PDS acts additively on individual G2-quadruplexes in the pathway to produce a strong cooperative suppression of PAs. In addition, several G2-PQS’s responded to changing levels of PAs in cells with feedback, for example PA addition suppressed the reporters from SMS and AZIN1 (drivers of PA synthesis), and activated those of SAT1 and OAZ2 (PA inhibitors). G-quadruplexes in regulatory regions affect gene expression in several different ways depending on their structures and their positions. Indeed, in our study most of the G2-PQS’s decreased - but a few increased - expression of their host genes; some affected protein levels exclusively, while others were active on the RNA levels. The majority of the motifs scored positively in assays consistent with a regulatory role in PA biosynthesis. In some cases they may synergize with other regulatory elements, such as uORFs that collectively serve as PA sensors, making minor individual contributions - and a major collective contribution - to the control of PA levels in an RNA structure-driven network. This is in line with a recent hypothesis that PAs are regulated by a common, yet undiscovered chemical or physical mechanism (Miller-Fleming et al., 2015). One possible function of such a network would be to control expression of the ‘polyamine modulon’ (Igarashi and Kashiwagi, 2011), a family of proteins whose translation is regulated by PAs in bacteria, yeast and mammalian systems to control cell proliferation. Misregulation of PAs is also directly associated with tumorigenesis and several polyamine inhibitors have been investigated in cancer clinical trials (Casero and Marton, 2007). The response of the PQS’s in PSP genes to PAs may help guard against cues which increase proliferation and cellular transformation/migration. A principle function of PAs in cells is to bind and stabilize RNA structures. The monocations K+, NH4+ and Na+ strongly stabilize G-quadruplexes by binding in the G-quadruplex cavity (Guiset Miserachs et al., 2016). It is therefore conceivable that the charged terminal amines of PAs may bind directly to G2-quadruplexes, possibly substituting for K+ and Na+ in the tetrad. Indeed, polyamines have been reported to stabilize, destabilize and alter DNA quadruplex structures in vitro (Keniry and Owen, 2014, 2013; Wen and Xie, 2013; Kumar et al., 2009; Keniry and Owen, 2007; Miyoshi et al., 2003; Keniry, 2003; Qi et al., 2014) and in one case evidence for polyamine-modulation of a DNA quadruplex in cells was presented (Kumar et al., 2009). In our in vitro study, AZIN15Q1 switched between a stem-loop and a G-quadruplex in the presence of different concentrations of salt and spermine. Overall, this behaviour may be reminiscent of the Iron Responsive Element, which is an RNA stem loop in the 5`UTR of mRNAs that encodes a family of proteins required for iron metabolism and homeostasis (Theil, 2015); binding of Fe2+ to the IRE alters translation of these mRNAs as a coordinated feedback control mechanism. Our work may indicate a similar role for PAs in PA self-regulation though altering or switching RNA structural elements present within PA biosynthesis genes. HeLa cells (ATCC, CCL-2, STR profiling and Mycoplasma tested) were maintained in DMEM (Gibco) supplemented with dialyzed fetal bovine serum (10%, Invitrogen) and aminoguanidine (1 mM, TCI Chemicals) in humidified 5% CO2 atmosphere at 37°C. To deplete cellular polyamines, 1.65 x 105 cells were grown in a T75 flask in the presence of DFMO (Bachem, 0.5 mM, DMEM) and APCHA (ABCR, 0.100 mM, DMEM) for 6 d (dosing at d0 and d2). To analyze the effect of polyamine supplementation during polyamine depletion, polyamines (Sigma Aldrich, 0.1 mM, DMEM) were added to the drug-treated cells on d5. Cells did not appear to be unduly stressed by the treatments, though proliferation was clearly slowed (cell confluency at d5: 60-70% untreated; 40-50% drug treated). The quadruplex stabilizing ligands and PDS (Sigma Aldrich) and the polyamine mix (ratio 1:1:1 putrescine, spermidine and spermine) were dissolved fresh in DMEM and used at the respective concentrations. PDS and polyamine mix were added to cells directly prior to plating for the reporter assays. Cell cytotoxicity of treatments was measured using a standard assay: it was not observed for PDS concentrations ≤128 µM. Sequences of the 3’-UTRs and 5’-UTRs of the PSPs were obtained from Ensembl (http://www.ensembl.org/index.html) (Supplementary file 1). The PSP UTRs selected were upstream of known protein coding sequences chosen based on their consistent annotation by multiple public resources (CCDS project and RefSeq) (Supplementary file 1). If several known transcripts fitting this criterion were available, an example was selected which contained quadruplexes conserved across ≥1 transcripts (Supplementary file 1). PQS were identified using the QGRS mapper (Kikin et al., 2006) and quadruplex phylogenetic conservation was assessed using QGRS-H mapper (Menendez et al., 2012) and through clustral-W alignment. Selected PSP UTR sequences where amplified from either synthetic oligonucleotides, cDNA encoded plasmids or cDNA reverse-transcribed from Huh7 or HeLa cells, using the M-MLV reverse transcriptase (Promega) according to the manufacturer’s instructions. Amplified sequences were sub-cloned into a dual luciferase psi-check-2 vector (Promega) upstream of the Renilla luciferase gene in the NheI single cloning site or downstream of the Renilla luciferase gene in the Not1-Xho1 multiple cloning site. Correct insertion was confirmed by DNA sequencing. For the 5’ UTRs, a modified psi-check vector placing the start codon at the natural position directly adjacent to the 5’-UTR insert was used (Calvo et al., 2009). All primers, cDNA plasmids and synthetic oligonucleotides used for reporter plasmid construction are listed in Supplementary file 1. Site directed mutagenesis was performed using the Q5 Site-Directed Mutagenesis Kit (NEB) with primers listed in Supplementary file 1. Mutagenesis was confirmed by DNA sequencing. Due to technical reasons four quadruplexes present in and at the 3' of a predicted uORF in the 5’-UTR of ODC1 and one quadruplex present in its 3’-UTR were excluded from this study. In addition, due to the complex nature of the OAZ2 3’-UTR with its 11 predicted quadruplexes, this was also excluded from this study. Cells (6 x 103 /well) were seeded in white 96-well plates. Plasmid DNA (20 and 40 ng for 3' and 5' UTR reporter plasmids, respectively) was transfected using JetPEI (Polyplus) according to the manufacturer’s instructions. Cells were lysed and both Firefly and Renilla luciferase activities were measured at 36 h post-transfection using the Dual-Glo Luciferase Assay System (Promega), according to the manufacturer’s instructions. Renilla luciferase activity levels were normalized to that of firefly luciferase activity. Wild type Renilla expression levels were normalized to that of the quadruplex destabilizing mutant. Intracellular polyamine extraction was carried out according to the procedure described by Morgan (Morgan, 1998). Cell pellets were homogenized by the addition of 50% TCA (2%) in PBS (100 µL/106 cells), followed by vigorous mixing. A synthetic amine, 1, 8-diaminooctane (Sigma Aldrich) was added to the crude mixture as an internal standard. The precipitated protein and cell debris were sedimented by centrifugation (10 min, 17,000 rpm, RT). The supernatant was removed, and both pellet and supernatant stored at -20°C until required. Before benzoylation, NaOH (4 eq., 2N) was added to the supernatant and the solution mixed vigorously. Following addition of benzoyl chloride (0.4, 50% solution in methanol) the resulting mixtures were incubated at RT for 45 min (with intermittent vortexing at 5 min intervals). Polyamines were extracted with chloroform (1 eq. ), washed with H2O (0.5 eq.) and evaporated to dryness. The residue was re-suspended in acetonitrile (42%), filtered and analyzed by HPLC. Benzoylated samples were injected on to an Agilent Eclipse XDB-C18 (250 mm) column and using an isocratic solvent system (42% acetonitrile) at a flow rate of 0.5 mL/min, benzoylated spermidine, spermine and, 1, 8-diaminooctane were detected at 198, 224 and 254 nm at 3.0, 5.2 and 5.6 min respectively. Polyamine levels of treated were normalized to that of untreated samples. The cellular polyamine levels were normalized to that of the amount of protein in the pellet. Pellet protein levels were quantified through the BCA protein assay (Thermo Scientific). Plasmids were linearized using the PmeI (AZIN1) or NOTI restriction enzyme, which cuts at the 3′ end of the coding region of the luciferase reporter gene after the 3′-UTR. 5′-capped transcripts were generated in vitro using the mMESSAGE mMACHINE T7 kit (Ambion), following the manufacturer's instructions. The RNA concentration was determined by UV spectroscopy. The integrity and the size of each transcript were confirmed by 2% agarose gel analysis. In vitro translation of 1500 ng of in vitro-transcribed mRNAs was carried out in a cell-free translation system consisting of extracts from nuclease-treated HeLa lysate (ThermoScientific, #88881). For protein analysis, cells were washed twice with ice cold PBS and resuspended in lysis buffer for protein extraction (1x PDS, 1% Triton X-100, protease inhibitor cocktail (Roche)). Cell lysates were obtained by centrifugation at 14.000 x g for 10 min at 4°C. Protein concentrations were estimated by the Bio-Rad protein assay using bovine serum albumin as standard. Lysates were separated by SDS/PAGE on a mini-PROTEAN TGX gel (BIO-RAD). Proteins were subsequently transferred to a polyvinylidene difluoride transfer membrane (Roche) using a transfer semidry blot cell (BioRad Laboratories), blocked (5% milk in 1x PBS-T, 50 mins, RT) and incubated with the appropriate antibody: anti-human SMS (Origene, TA503099, 1/1000) and anti-human AZIN1 (Sigma-Aldrich, WH0051582M1, 1/1000) in blocking buffer, overnight at 4°C. Immunoblots were visualized with ECL Prime Western Blotting Detection Reagent (GE Healthcare) using horseradish peroxidase-labelled secondary antibodies (1 h; RT; blocking buffer). To confirm equal loading in each sample, the membranes were stripped in stripping buffer (200 mM Glycine, 3.5 mM SDS and 0.0001% Tween20) and re-blotted with anti-β-actin (Santa Cruz Biotechnology, sc-69879). The images were captured and analysed with a ChemiDoc Touch Imaging System (BIO-RAD). Densitometric analysis was performed using Image Lab software (BIO-RAD). RNA samples were prepared as described in reference (Guennewig et al., 2014). Prior to their use, RNA was prepared in annealing buffer containing lithium cacodylate buffer (10 mM. pH 7.2), KCl (100, 10 or 1 mM) with and without spermine or spermidine (at the stated concentrations). RNA samples were heated at 90°C for 10 min and immediately slow cooled to 5°C at a controlled rate of 0.2°C min-1. Oligoribonucleotide concentrations were monitored by OD and adjusted to ensure equal loading across sample wells. Glycerol (50%) was added to pre-annealed oligonucleotides (see RNA preparation and annealing) at a final concentration of 10% prior to gel loading on to a 15% native PAGE gel. Following sample loading, the gel was run at 50 V for 2-3 h. Gels were stained with 1× SYBR Gold (Life Technologies) for 40 min before visualization on a Gel Doc XR (BioRad). Differences in Syber gold staining of the WT and M oligonucleotides is likely due to the sequence-selective binding nature displayed by Syber gold (Tuma et al., 1999). Oligoribonucleotides were prepared and gel-loaded as above. Following sample loading, the gel was run at 50 V for 2-3 h. Gels were incubated in 0.5 µM 3,6-dimethyl-2-(4-dimethylaminophenyl) benzothiazolium (ThT, Sigma-Aldrich, tris-borate-ethylenediaminetetraacetic acid) for 15 min under gentle agitation and briefly washed in water before visualization on a Typhoon Trio+ Imager (GE Healthcare). ThT stained bands were quantified using imageQuant™ software and used to calculate the average amount of signal detected. UV melting experiments were performed using a Varian Cary 300 spectrophotometer. RNA was prepared as described in RNA preparation and annealing above. The UV absorbance profiles were recorded at 295 and 260 nm during one cycle of cooling/heating between 90 and 5°C at a rate of 0.2°C/min. Thermodynamic parameters and melting temperature (Tm) values were derived as described in reference (Mergny and Lacroix, 2009). CD experiments were performed using a Jasco J-10 spectropolarimeter. RNA was prepared as described in RNA preparation and annealing above. Two CD scans over the wavelength range of 220 to 320 nm were performed at 50 nm min−1 with a 2 s response time, 1 nm pitch and 1 nm bandwidth, and the average taken. For each experiment, a CD spectrum of buffer alone was recorded and subtracted from the spectrum obtained for the oligonucleotide containing solution. Thioflavin T staining is the gold standard for identification of novel quadruplex structures (Xu et al., 2016). The experiments were carried out in 96-well microplates. The annealed RNA samples were incubated with spermine for 1 hr at RT. ThT (4.5 μM) was added and measurements were performed at room temperature. The fluorescence emission was collected at 487 nm with excitation at 440 nm in a microplate reader (Tecan Spark 20M). RNA was prepared to a concentration of 0.03-0.5 mM in 10 mM lithium cacodylate, 1 mM KCl or LiCl, pH 5.8 using 3’000 NMWL Amicon Ultra Centrifugal Filters (Merck Millipore Ltd., IRL). After heating to 95°C for 5 min KCl (100 or 200 mM), NaCl (100 mM) or MgCl2 (2 mM) was added directly to the warm solution containing the oligonucleotides. The samples were then progressively cooled down to room temperature for 60 min before to be stored on ice. One-dimensional watergate 1H NMR spectra 2D 1H 15N HSQC and 2D 1H-1H noesy spectra were recorded at 288 K on Bruker AVIII-500, 600 and 900 MHz spectrometers equipped with a cryoprobe. Topspin 2.1 (Bruker) was used for data processing. The secondary structure of the hairpin RNA was illustrated with the RNA visualization toolforna (Kerpedjiev et al., 2015). independent replicates represent experiments performed with independent batches of cells and reagents. Data are represented as the mean ± standard error (SE). P-values were calculated for cell or lysate based experiments with ≥3 biological replicates using the t-test. Journal of Biomolecular NMR 52:289–302. Journal of Biological Chemistry 291:21751–21760. Journal of the American Chemical Society 134:19953–19956. Organic & Biomolecular Chemistry 8:2771–2776. Nature Reviews Drug Discovery 6:373–390. JBIC Journal of Biological Inorganic Chemistry 21:975–986. Methods in Molecular Biology 720:51–65. Journal of Molecular Recognition 26:308–317. Angewandte Chemie International Edition 55:8958–8961. Current Protocols in Nucleic Acid Chemistry Chapter 17:Unit 17.1. Journal of Molecular Biology 427:3389–3406. Wiley Interdisciplinary Reviews: RNA 3:495–507. Nucleosides, Nucleotides and Nucleic Acids 22:1591–1594. Journal of the American Chemical Society 132:17831–17839. Journal of the American Chemical Society 134:812–815. G-quadruplexes within prion mRNA: the missing link in prion disease? The Journal of Physical Chemistry B 117:6896–6905. Journal of Molecular Biology 222:819–832. Journal of the American Chemical Society 134:19297–19308. Thank you for submitting your work entitled "Control of the polyamine biosynthesis pathway by RNA G2-quadruplexes" for consideration by eLife. Your article has been reviewed by three peer reviewers, and the evaluation has been overseen by Reviewing Editor Douglas Black and Senior Editor James Manley. The following individuals involved in review of your submission have agreed to reveal their identity: Cyril Dominguez (Reviewer #2). Our decision has been reached after consultation between the reviewers. Based on these discussions and the individual reviews below, we regret to inform you that your work cannot be considered further for publication in eLife. There was general agreement among the reviewers and the reviewing editor that the identification of regulatory G-quadruplexes was of some interest and that several findings had merit. However, it was also thought that the analysis did not go very deep. Instead of doing a limited analysis of multiple elements, it would be more significant to do a conclusive analysis of one or two. Notably, neither the existence of the identified elements as quadruplexes, especially those with 0-length loops, nor the role of the elements in controlling polyamine biosynthesis, were demonstrated to a high degree of certainty. For the study to be of interest to the broad audience of eLife, these findings would need much stronger support. Generating such data would take much longer than the maximum 8 weeks allowed for a revision. Thus, although some of the initial responses were positive, the consensus decision was to decline the manuscript. In this paper Hall and Lightfoot provide a survey of locations of possible G quartet structures within 5' and 3' UTRs of mRNAs for enzymes in the polyamine pathway(s) of mammalian cells. Their interesting idea is that perhaps since polyamines might interact with G-quartets, then G-quartet structures might signal the presence of regulatory elements that respond to changes in polyamine levels in the cell. They develop several assays for their analysis – expression of the target gene as wt and as a mutation designed to ablate the putative G-quartet (PQS) in vitro and in cells – comprise one set of assays. Other assays include structural and dye binding assays on model RNAs that are designed to distinguish G-quartets from other RNA folds. Finally, a bold in vivo approach is taken to hyperstabilize G-quartets with pyridostatin in vivo and see how this affects expression of endogenous genes and reporters, and the results are mostly consistent with the mutational data. A major concern is that there are too many genes studied at too shallow a depth. There are many lower resolution and correlative assays employed so that the conclusions rely on the aggregate acceptance of many different assays each with different alternative explanations, and some of which work better on some genes and selected elements than others. The assays for structure determination aren't nucleotide resolution, and it remains tricky to predict these structures confidently by computational methods. Overall the need to accept this as an aggregate survey weakens the conclusiveness of the presentation. Having done this interesting survey, the authors are likely interested in higher resolution study of one or a few of these elements in detail that would really nail down the idea that G-quartets interact with polyamines to control expression of polyamine metabolic enzymes. 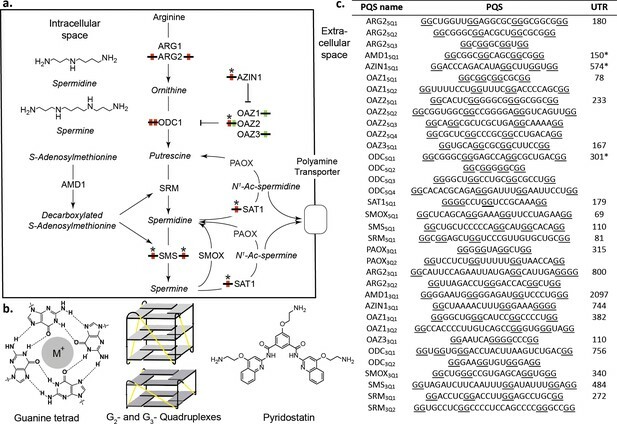 In the manuscript, Lightfoot and Hall describe the effect of transient G2-quadruplexes on the expression levels of proteins involved in the polyamine biosynthesis pathway. Enzymes involved in this pathway are regulated at different levels including transcriptional and post-transcriptional levels. The authors hypothesized that these levels could be regulated at the post-transcriptional level by specific RNA structures, G-quadruplexes. Indeed, RNA G-quadruplexes have already been shown to play a role in RNA metabolism regulation, such as translation, splicing,. Using bioinformatic tools, the authors identified putative G-quadruplex forming sequences (PQS) in the 5' and 3'UTR of many genes involved in this pathway. They validated the effect of these putative G-quadruplexes using in vivo and in vitro assays on WT and mutated sequences, as well as the effect of a well-characterized G-quadruplex stabilizer. Overall, the manuscript is well written, clear, and sound. The authors nicely demonstrate that while many PQS do not have any effect on protein expression, other have a significant influence. The study of mutated sequences in itself is controversial (is the effect of the mutation due to a disruption of the G-quadruplex or a change in the ratio of proteins bound is always difficult to assess) but the complementary approach of testing the effect of a G-quadruplex stabilizer on protein expression makes the conclusions strong and compelling. The final conclusion of the manuscript that spermine itself stabilizes G-quadruplex is interesting but lacks in my view strong evidence. The in cells experiments cannot provide evidence that the observed effects are direct and the in vitro validation assays have been done only on one PQS (AZIN1). It would be interesting to test the effect of spermine of the stability of other PQS sequence that respond to spermine in cells such as SMS5Q1, SMS3Q1, SAT15Q1 and OAZ25Q1. It would also be interesting to compare the effect of spermine and PDS on G-quadruplex stabilization in vitro. Subsection “PSP long-looped G2-PQSs perform as quadruplexes in cells”: The authors observed that the effect of PDS on AZIN15Q1 was opposite to what was expected based on the mutant results. However, AZIN1 also has a PQS in its 3'UTR (AZIN13Q1). It would be interesting to test the effect of PDS on this reporter. This is a well described study by Lightfoot and Hall that demonstrates many G-rich sequences regulate the RNA and protein levels of proteins important in polyamide (PA) biosynthesis. The authors identify many putative G-quadruplexes in the 5' and 3' UTRs of PA protein-coding genes and show that some of these elements can form G-quadruplex structures in vitro and provide evidence that they may function via these structures using a small molecule known to bind G-quadruplex structures. This work adds to our understanding of how these genes are regulated through potential G-quadruplex structures. Although this is an interesting body of work, several concerns reduce enthusiasm for publication in eLife. 1) A major concern is that there doesn't appear to be any data in this manuscript or other publications (search by this reviewer of the literature) that show G-quadruplexes can form without a single nucleotide loop (usually defined as 1-7 nucleotides although longer loops exist as previously demonstrated and in this work). If these references exist it would be helpful for the authors to include. Structurally, it doesn't seem possible for the four Gs to be split into two parts of the G-quad. This should be demonstrated or explained if previously published data hasn't demonstrated this unique G-quadruplex structure before. This point applies to the elements in SAT1, AZIN1 and OAZ3. 2) Presumably the authors tested if polyamines bind and stabilize / destabilize the putative G2 quadruplex structures. These results should be included or discussed because otherwise the reader is left wondering how the polyamines self-regulate except for the AZIN1 example. For the AZIN1 data, the authors should correct ΔAbs of ~0.2 to ~0.02 in the Results section (Long-looped AZIN1 G2-quadruplex is induced by PAs in vitro). Again, please provide a rationale for how a G-quad can form without a loop nucleotide (see point #1) and not just state that high resolution structural studies will need to be performed (Discussion section). If the authors demonstrate G-quads can form without a loop this would be a major finding for the field and would be of great interest. The data for the 3 putative G-quads lacking loops is weak compared to the data provided for the G-quads with loops. 3) A more minor concern is the data shown in Figure 2. Several of the gel images for the Thioflavin-T with the G-quadruplexes don't appear to match the quantitation shown in the next panel although this could be explained by loading differences. For example, for ODC15Q2 there is a 2-fold difference in fluorescence quantitation, which doesn't seem to match the adjacent gel image. This might be explained by the significant difference in the loading of RNA seen in the first panel. If the RNA concentration levels or ability to detect RNA is significantly different for some species it may call into question the ability to detect differences between WT and mutant RNAs. 4) A minor point is why do the authors not spend more time in the discussion on the most significant PA regulatory element they identified in SAT1 (30-fold change)? Thank you for resubmitting your article "Control of the polyamine biosynthesis pathway by G2-quadruplexes" for consideration by eLife. The evaluation has been overseen by Douglas Black as Reviewing Editor and James Manley as the Senior Editor. Your revised article has been reviewed by two of the previous reviewers and one new reviewer. The following individual involved in review of your submission has agreed to reveal his identity: Cyril Dominguez. The reviewers have discussed the reviews with one another and the Reviewing Editor has drafted this decision to help you prepare a revised submission. It was generally agreed that the submission was much improved, but additional work was needed. Given the very loose restraints on the G2 search criteria it is not surprising that many sequences were found. However, it seems possible that the G2s could be involved in alternative secondary structures that are not quadruplexes. Have the authors checked the PQS's for other secondary structures (for example, by M-fold?). Transfected dual luciferase assays can be highly variable and the gold standard would be to report errors from at least 3 independent replicates, not 2. For example, AZIN1 has a strong effect in the dual luciferase assay (Figure 2A) but does not behave like a quadruplex in the biophysical assays in Figure 3. This could be an indication that the dual luciferase assay is not necessarily reporting on quadruplex formation. Negative controls are needed showing that mutations in the predicted loop regions have no effect in the dual luciferase assay. AZIN1 showed no evidence for quadruplex formation in the biophysical assays (Figure 3), yet this is the only RNA that was chosen for further characterization by NMR in order to demonstrate quadruplex formation. The rationale for pursuing AZIN1 needs to be explained. How does the addition of polyamines affect the biophysical characterizations in Figure 3? Figure 5. The 1H signals around 11 ppm are consistent with quadruplex formation but this is not conclusive as other types of base pairs can also give rise to resonances in this region of the proton spectrum. A 1H-15N through hydrogen bond NMR experiment is needed to really show this. Do the RNAs that respond to Thioflavin T also have similar 1D NMR spectra? A major concern is that there are too many genes studied at too shallow a depth. There are many lower resolution and correlative assays employed so that the conclusions rely on the aggregate acceptance of many different assays each with different alternative explanations, and some of which work better on some genes and selected elements than others. Concerning "too many genes": The message of the paper is that several quadruplexes from different genes work cooperatively to regulate an important pathway. Nature often works in this fashion, so it is worthy of investigation. Such a study must consider the function of many elements in order to probe the pathway. Concerning "too shallow": Briefly: from an initial screen of 35 elements (Figure 2), we followed up on 7 putative quadruplexes (PQS's), for which we acquired data using all known biophysical and cellular techniques for quadruplexes, including: (1) reporter assays + mutated controls in cells, (2) in vitro transcription/translation assays, (3) gel migrations, (4) ThioT stainings, (5) UV melts, (6) CD spectra (Figure 3). With the exception of ARG3Q1 and AZIN1 (for which we provided credible data-based explanations (Figure 2D, Figure 4, new Figure 5, Figure 5—figure supplement 1, Figure 5—figure supplement 3), the outcome from all of these techniques for the PQS's were consistent with our proposed structures and function. Finally, we investigated PQS's from AZIN 1 and SMS in cells (Figure 4). We showed that the endogenous proteins and luciferase reporters performed identically, in response to a known quadruplex-stabilizing drug and a polyamine depleting-drug with subsequent polyamine rescue. So, with respect, we see the referee's call for "stronger support" and "the need to accept this as an aggregate survey" as unjustifiable. In the new manuscript we have investigated in more detail AZIN1 with a high-resolution NMR study. The data confirms our hypothesis that the AZIN1 quadruplex equilibrates with stem structures, and that the equilibrium is shifted in predictable fashion for a quadruplex by changing concentrations of potassium, magnesium and sodium. The assays for structure determination aren't nucleotide resolution, and it remains tricky to predict these structures confidently by computational methods. Overall the need to accept this as an aggregate survey weakens the conclusiveness of the presentation. Having done this interesting survey, the authors are likely interested in higher resolution study of one or a few of these elements in detail that would really nail down the idea that G-quartets interact with polyamines to control expression of polyamine metabolic enzymes. We are not sure that we understand the referee's comment. We have added a nucleotide-resolution assay with the 1H NMR study of AZIN5Q1 (new Figure 5 and new Figure 5—figure supplement 1). The final conclusion of the manuscript that spermine itself stabilizes G-quadruplex is interesting but lacks in my view strong evidence. The in cells experiments cannot provide evidence that the observed effects are direct and the in vitro validation assays have been done only on one PQS (AZIN1). The referee is referring to the final figure. We agree that the evidence for direct interaction is not strong and derives from in vitro experiments. The new NMR data does provide additional evidence for such an interaction, but as the direct interaction is not the main message of the paper, we have moved old Figure 5 to Figure 5—figure supplement 3 and have toned down (removed text and emphasized that data is from in vitro experiments) our implications of recognition of the AZIN1 quadruplex by spermine. It would be interesting to test the effect of spermine of the stability of other PQS sequence that respond to spermine in cells such as SMS5Q1, SMS3Q1, SAT15Q1 and OAZ25Q1. It would also be interesting to compare the effect of spermine and PDS on G-quadruplex stabilization in vitro. We did indeed test the effects of spermine on other G2-PQS's SMS and SAT1: there was a small effect on SMS5Q1 but no effect on SAT1. We added a statement on this to the manuscript (subsection “Predicted G2-PQS’s in PSP UTRs”). We did not perform experiments with PDS in vitro. Given the different status of the cells with respect to polyamine levels, the effect of PDS on AZIN15Q1 was perhaps not so surprising. We have elaborated on this with a small additional text (subsection “PSP long-looped G2-PQSs perform as quadruplexes in cells”). 1) A major concern is that there doesn't appear to be any data in this manuscript or other publications (search by this reviewer of the literature) that show G-quadruplexes can form without a single nucleotide loop (usually defined as 1-7 nucleotides although longer loops exist as previously demonstrated and in this work). If these references exist it would be helpful for the authors to include. Structurally it doesn't seem possible for the four Gs to be split into two parts of the G-quad. This should be demonstrated or explained if previously published data hasn't demonstrated this unique G-quadruplex structure before. This point applies to the elements in SAT1, AZIN1 and OAZ3. Piazza et al., 2017 shows quadruplexes with a zero-nucleotide loop. We have added a short sentence and reference in the text (subsection “Predicted G2-PQS’s in PSP UTRs”). We did not further characterize the zero-looped quadruplexes because this non-canonical structure is not the main message of the paper. 2) Presumably the authors tested if polyamines bind and stabilize / destabilize the putative G2 quadruplex structures. These results should be included or discussed because otherwise the reader is left wondering how the polyamines self-regulate except for the AZIN1 example. We added a sentence to the text stating that polyamine addition had no effect on the UV melt traces of other long-looped G2-PQS (SMS and SAT1). For the AZIN1 data, the authors should correct ΔAbs of ~0.2 to ~0.02 in the Results section (Long-looped AZIN1 G2-quadruplex is induced by PAs in vitro). Again, please provide a rationale for how a G-quad can form without a loop nucleotide (see point #1) and not just state that high resolution structural studies will need to be performed (Discussion section). If the authors demonstrate G-quads can form without a loop this would be a major finding for the field and would be of great interest. The data for the 3 putative G-quads lacking loops is weak compared to the data provided for the G-quads with loops. There are no differences in loading, which is done on the basis of OD measurement, and experiments are repeated multiple times. Apparent differences between wild type and mutants on the migration gels are likely because Syber Gold shows a degree of sequence-selective binding (as reported in Tuma et al., 1999). Although SAT1 is interesting, we found AZIN1 more interesting due to its structural equilibria and its strong regulation in cells. We have therefore added results from an NMR study of AZIN1 to the revised manuscript (new Figure 5 and Figure 5—figure supplement 1). We have checked the principal PQS's of Figure 3 by M-Fold. As expected for G-rich seqs, most of them show possible hairpin structures. However, given the strong evidence for the PQS's shown in Figure 3, particularly from the UV295-melting and Thioflavin T staining we did not pursue other secondary structures. Transfected dual luciferase assays can be highly variable and the gold standard would be to report errors from at least 3 independent replicates, not 2. Our legend describing biological replicates for Figure 2A in the original manuscript was ambiguous: we have corrected it in the new manuscript. For each PQS that produced a statistically-significant difference between wild-type and control, the data represents 3-7 independent biological replicates. For PQS's that were inactive and were dropped from further investigation, data is presented from n>/=2 independent biological replicates. For example, AZIN1 has a strong effect in the dual luciferase assay (Figure 2A) but does not behave like a quadruplex in the biophysical assays in Figure 3. This could be an indication that the dual luciferase assay is not necessarily reporting on quadruplex formation. Negative controls are needed showing that mutations in the predicted loop regions have no effect in the dual luciferase assay. The referee's assumption that generally mutating the loop sequences of a quadruplex should have no effect on luciferase activity is incorrect, according to previously published work which states that loop sequence is one of the 4 major determinants of quadruplex stability (Pandey, Agarwala and Maiti, 2013). (We stated this in the Introduction "The stability of G-quadruplexes is governed by the number of G-quartets, the loop length and composition"). As an aside, we actually agree with the referee "that the dual luciferase assay is not necessarily reporting on quadruplex formation": strong data in our manuscript (especially the new NMR data) describes a quadruplex/hairpin equilibrium for AZIN15Q1. Thus, the referee's suggested experiment would not be a negative control; the best negative control is mutation of key G's, as we have done. We explained the reasons for pursuing AZIN1 on Line 472 of the second submission. We have expanded on this a little more in the new submission (see subsection "Long-looped AZIN1 G2-quadruplex equilibrates with hairpin structures"). The referee has not stated a purpose for this rather wide-ranging question, nor stated which quadruplexes he/she refers to. Does the referee mean to test ALL 14 RNAs of Figure 3 in presence of polyamines in gel migrations, ThioT stainings, UV-melts and CD? Testing one polyamine at one concentration on a quadruplex and its mutant after optimizing conditions (e.g. polyamine conc., the presence/absence of Mg/K), whilst avoiding RNA precipitation etc. represents dozens of experiments. We respectfully submit that grossly expanding the data set in this way without a specified reason would not add useful support for quadruplex structures above what we already have shown with biophysical experiments of Figures 3 and the new exhaustive NMR investigation. Figure 5. The 1H signals around 11 ppm are consistent with quadruplex formation but this is not conclusive as other types of base pairs can also give rise to resonances in this region of the proton spectrum. A 1H-15N through hydrogen bond NMR experiment is needed to really show this. We agree with the referee and thank him for the suggestion. We performed these experiments, as well as additional experiments to nail this down. Signals around 11 ppm are characteristic for G-imino protons involved in H-bonds in GU base pairs, or H-bonding interactions with O6 from guanines in G-quadruplexes (Jin, 1990; Wang et al., 1991; Wang et al., 1919; Smith and Feigon 1992). To confirm that our signals from AZIN1wt at around 11 ppm (Figure 5b) were indeed G-imino protons, we in vitro-transcribed a 15N-labeled AZIN1wt and recorded a 1H 15N-HSQC. Similarly to what was previously reported for RNA G-quadruplexes (Nasiri et al., 2016)6, we observed that the protons of AZIN1wt located at 11 ppm and the quadruplex positive control (AZIN1M2) were bound to 15N atoms with a chemical shift of about 145 ppm (new Figure 5—figure supplement 2A,B, respectively), which is characteristic for guanine N1 atom involved in a G-quadruplex or a GU wobble. Imino protons from GU base pairs can easily be seen in a 1H-1H 2D NOESY due to the strong OE between the imino protons of guanine and uridine; furthermore, U-imino protons are typically seen in a 1H 15N-HSQC at around 160 ppm for N3. Neither strong imino-imino NOE's, or H3-N3 imino cross-peaks, were observed in our spectra (new Figure 5—figure supplement 2). We therefore conclude that all the cross-peaks observed in the 1H 15N-HSQC at 10-11 ppm in the proton dimension originate from a G-quadruplex. In addition, G-quadruplex formation also gives rise to typical NOE patterns involving the imino, amino and aromatic protons of the guanine nucleotides involved in the G-quadruplex formation (Smith and Feigon 2010; Jin, 1992 and Macaya, 1993). So, we then recorded a 2D NOESY with AZIN1wt (new Figure 5—figure supplement 2C). NOEs' typical of G-quadruplexes between neighbouring imino groups and between imino and amino (shifted to 9-10ppm compared to Watson-Crick base-pairs) are present in the spectrum consistent with previous reports (Nasiri et al., 2016). Taking these results together with the increased relative intensity of these imino signals in the presence of K (stabilizing the G-quadruplex) and the decrease in the presence of Na/Mg, provides strong evidence for formation of a G-quadruplex by AZIN1wt (Figure 5c, Figure 5—figure supplement 1) The conclusion is strengthened by the 1D 1H and 1H 15N-HSQC spectra from the mutants AZIN1M1 and AZIN1M2 (new Figure 5—figure supplement 2B, Figure 5b). Do the RNAs that respond to Thioflavin T also have similar 1D NMR spectra? We prepared large quantities of ODC15Q1, ARG25Q1, OAZ25Q1 and OAZ25Q2 and tested their ability to form G-quadruplex structures by 1D NMR. We used NRAS as a positive control as it was previously shown to adopt a G-quadruplex structure (Bugaut et al., 2010). For all these RNAs, imino protons were detected at 11 ppm indicating their ability to form G-quadruplex structures (new Figure 5—figure supplement 1). We also prepared 15N-labeled versions of ARG25Q1, OAZ25Q1 and OAZ25Q2. In each case, we found that the imino protons observed at 11 ppm were attached to nitrogen atoms with chemical shifts of about 145 ppm (new Figure 5—figure supplement 1E-G). We saw no evidence of GU base pairs formation for any of these RNAs. We thank A Camus, M Jayakumar, D Kayalar, F Schmitz-Hübsch, Q Nguyen, T Hua, L Isenman, L Thommen and A Laski for help with cloning and/or preliminary experiments, and N Luedtke for comments on the manuscript. This work was supported in part by grants from the ETH (to JH), the NCCR RNA and Disease, funded by the Swiss National Science Foundation (to FHTA) and the Novartis Foundation (formerly the Ciba Geigy Jubilee Foundation) (to HLL). © 2018, Lightfoot et al.